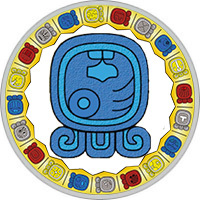 Mayan Name: KIEJ / Manik. Meaning: Deer, The Healing Hand. Compatibility: Deer, Monkey, Eagle, Storm, Night. Mayan sign of Deer (Manik) — acquisition, extraction. The meaning of the sign is the hand, the protector is God deer Tohil. In the ancient Mayan manuscripts, the Gods of the hunt are depicted with scorpion tails, which end with the hand. The Manic symbol is a compressed hand, the hand of a hunter. The Indians believed that the God of the hunt equally patronizes the people and their victim — a deer. According to legend, when people approach, God hunters with his whistling, warns the deer about the danger. At the heart of the myth is the idea typical of the Maya Indians: deer and hunters are not enemies, they are one in the cycle of birth and death. The Mark of the Deer is a symbol of the sacred rhythm of life, to which all living things on earth obey. People of the Deer zodiac have a proud, freedom-loving character. Do not need advice, act independently and resolutely. Trust intuition, rely entirely on inner feelings, do not consider it necessary to seek a rational explanation for their actions. Too careless, in all relying on luck, people often get into unpleasant stories. They like to live on a broad foot, travel a lot. Representatives of this sign should at times sometimes analyze their own actions. Egoism, vanity, pride are qualities that need correction. Responsible, intelligent people of the sign Deer — a find for the employer. Well-educated, tactful, but firmly following the goals of employees are always in good standing with the management. Enough ambitious people try to achieve a high position, believe that they deserve recognition and respect. Luck, perseverance are qualities that promote success in all spheres of activity, but they are more fond of creative professions: artist, artist, designer, art critic. They get a real pleasure from work, do not consider it necessary to force oneself to engage in unloved business. Sensitive people of the Deer are simply created for love. Are ready for any madness for the sake of the elect, but also in return demand full return. Too proud and independent people to put up with an indifferent attitude. They need to feel the most loved and desired people in the world. The temperamental man of the sign Deer can harass his partner with jealousy and suspicion. The truth no less passionately expresses its love: gifts, compliments, endless surprises. People of this sign have the reputation of honest, reliable people, they are not interested in short-term novels on the side. Charming man of the sign Deer is always in the spotlight. Attracts women with her courtesy, beautiful manners. At the same time, it feels the core, the ability to protect, surround with care and love. Rivals respect the man of this sign for the firmness of character, honesty. The surrounding people agree in one opinion: a decent, decent person. He easily walks through life, happily avoids failures. But if suddenly finds himself in a quandary, he loses the ability to control his feelings, displays anger and aggression. A woman of the sign Deer seems to many to be too narcissistic and proud of a person. Only close people, she can reveal the secrets of her soul, share experiences and doubts. A timid, hypochthonous person often doubts his strength, painfully perceives failure. Feels safe only in comfortable conditions, strives for a luxurious life. Often, too much time is devoted to the material component, forgetting about the soul. Nature has endowed her with many talents: the woman of the mark Deer will be able to cope with all problems if she trusts intuition and believes in her own strength.